Order our limited edition subscription box featuring a selection of the best goodies from our region. 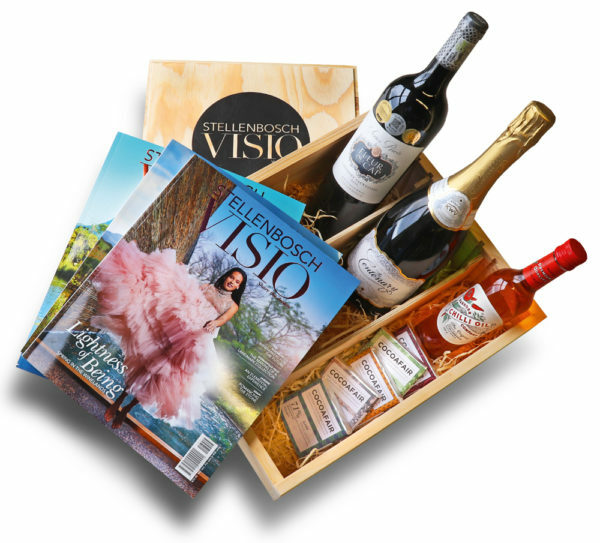 Order here and receive a one year subscription to Stellenbosch Visio along with a celebratory box filled with amazing items to the value of R1000*! Click here and follow the links. *Subscriptions are closing on the 21st and will be returning on the 3rd of January. No new deliveries be accepted during that period. International subscribers unfortunately do not qualify for the promotional offer. Local subscriptions including VAT & postage. ** International subscriptions R995. Ts&Cs apply.